OUR MISSION IS TO CHANGE THE PATH OF AT-RISK YOUTH THROUGH EDUCATION AND EXAMPLE. When I started New Image Youth Center in 2004, I simply wanted to give a few local children a safe place to learn and play. I never imagined where the journey would take us. Today, through the dedication of our staff and volunteers, we provide year-round services to students of all ages, and have helped many of our graduates achieve their dreams of going to college. With your help, we intend to strengthen and expand services to allow all of our youth to realize their dreams. Thank you for your support! Dr. Shanta Barton-Stubbs with a few of the New Image alumni. Hear from the students themselves and how together, with New Image Youth Center, they make the community a special place. There is GOOD in the HOOD! 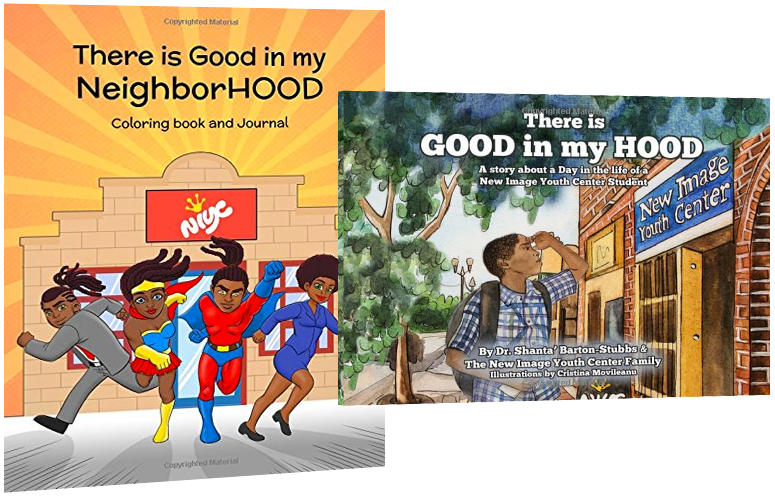 There's Good in My Hood is a book that highlights how children living in poverty-stricken areas find ways to succeed and demonstrates that there is always hope, sometimes just around the corner. NEW! There is Good in my NeighbourHOOD - This is no ordinary coloring book, but one designed to help encourage minority youth to recognize all of the successful people who are in their neighborHood.